Dirk Nowitzki of the Dallas Mavericks walks by head coach Rick Carlisle. The Denver Nuggets are soaring. The Dallas Mavericks are sinking. They could be on a collision course to meet in the first round of the playoffs. J.R. Smith broke a tie in the final minutes with a layup and immediately followed with a jumper, lifting the Nuggets to a 104-96 victory over the struggling and short-handed Mavericks on Wednesday night. Denver bounced back from a loss at home the night before to win for the seventh time in eight games. Smith scored 23 points and Kenyon Martin added 18, pushing the NBA's highest-scoring team back over 100 points after going a season-worst three straight games in double figures. "Everybody's starting to come together after the moves we made," Martin said. "No better time than now to start playing your best basketball. You don't want to go into the playoffs limping." The Nuggets have nestled into the No. 5 seed in the Western Conference playoffs with just four games left in the regular season. The Mavericks -- losers of four straight, and in an 8-9 rut since ending an 18-1 surge -- have only a one-game lead over Oklahoma City for the No. 3 spot. The Thunder would hold the tiebreaker over the Mavs. Whoever winds up fourth would open the playoffs against the fifth seed. The Nuggets play at Oklahoma City on Friday night; Denver just lost to the Thunder on Tuesday night. "If we have to play (Dallas), we'll be ready," Smith said. Said Denver coach George Karl: "I just think it's gonna be Oklahoma City." The Mavericks didn't exactly play this game like a team worried about skids or seeds. Off since Sunday and with another day off Thursday, they gave center Tyson Chandler a second straight game off to recover from a bruised back. They also forced Jason Kidd to give his 38-year-old body a break; it was the first game he'd missed all season. "I don't think it does any good to watch (the standings) now," said Dirk Nowitzki, who scored 20 points. "We've got to start playing better and feel good about ourselves going into the playoffs." Without two key players, Dallas still managed to turn a 16-point deficit in the third quarter into a tie at 94 with 2:51 left. However, the Mavericks scored only one more basket, and that only came courtesy of a goaltending call on Martin. It made him feel good, though, as he swatted a layup into the seats with 19.5 seconds left. Shawn Marion led the Mavericks with 21 points. Brendan Haywood, starting in Chandler's place, grabbed a season-high 19 rebounds with five blocks, and Jason Terry had 15 points. 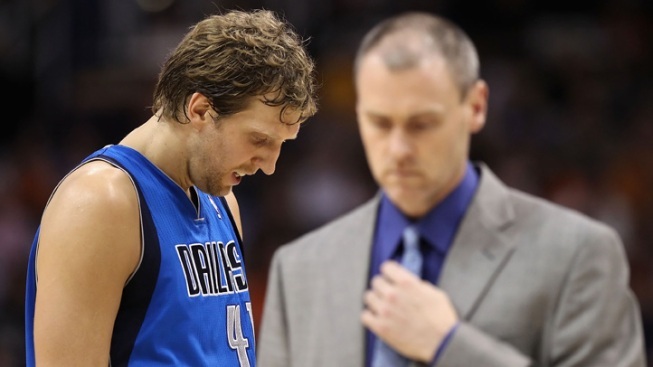 "Right now, with our team, we're not about measuring sticks," Dallas coach Rick Carlisle said. "It's about getting our physical and mental disposition where it needs to be and move forward feeling like we're making progress." Denver led by 10 at halftime and stretched it to 61-45 during a lethargic start to the second half. In one stretch during the opening minutes, the Nuggets put up a 3-pointer that thudded against the backboard, then the Mavericks shot an airball on a 3-point try. Denver followed with a basket and when Rodrigue Beaubois went to throw it in for Dallas, none of his teammates were around to catch it. Then the Mavs caught a spark. They went on a 16-4 run capped by J.J. Barea ducking his way through a collision of two big guys, getting into the lane and feeding Marion for a dunk that got Dallas within 65-61. The Mavericks went ahead 77-76 early in the fourth on a jumper by Nowitzki, then were trailing 94-85 later in the quarter. A 3-pointer by Terry got Dallas within 94-90 and brought the crowd to life. Marion made a high-arching layup to push the Mavericks even closer, then Beaubois tied it with a pair of free throws following a backcourt steal. Then Smith started a 10-2 scoring spurt to finish it. "We stayed the course and made them take tough shots, limited them to one shot, and executed on the offensive end," Martin said. "We just wanted to bounce back from a rough loss last night. You don't want to lose two straight. We wanted to make a good show and we played well from the start." Wilson Chandler scored 16 points for the Nuggets. Danilo Gallinari and Al Harrington each scored 10. Nene had nine points and 15 rebounds. NOTES: Terry had a technical foul down the stretch, his second such costly loss-of-temper in the last week. "He knows (trying to incite him) is going to be everyone's game plan," Carlisle said. ... Kidd had been hoping to play all 82 as a matter of pride. He's done it twice in his career, last in 2001-02. ... The Nuggets are expecting to be without rookie C Timofey Mozgov for about two weeks because of a sprained left knee and ankle sustained Tuesday night. ... Denver's Chris Andersen missed his third straight game with a sprained ankle. "We're hopeful for Friday," Karl said. Arron Affalo remained out with a hamstring injury. When these teams last met, he hit the winning shot in the closing seconds. That was Dallas' only loss in the 18-1 stretch.